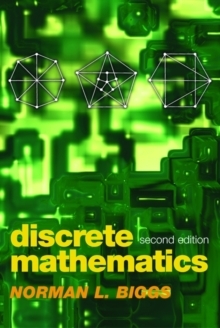 Biggs' Discrete Mathematics has been a best-selling textbook since the first and revised editions were published in 1986 and 1990, respectively. This second edition has been developed in response to undergraduate course changes and changes in students' needs. New to this edition are chapters on statements and proof, logical framework, and natural numbers and the integers, in addition to updated chapters from the previous edition. The new chapters are presented at a level suitable for mathematics and computer science students seeking a first approach to this broad and highly relevant topic. Each chapter contains newly developed tailored exercises, and miscellaneous exercises are presented throughout, providing the student with over 1000 individualtailored exercises. This edition is accompanied by a website www.oup.com/mathematics/discretemath containing hints and solutions to all exercises presented in the text, providing an invaluable resource for students and lecturers alike. The book is carefully structured, coherent and comprehensive, and is the ideal text for students seeking a clear introduction to discrete mathematics, graph theory, combinatorics, number theory, coding theory and abstract algebra.